Robots and foreigners have been taking over Dutch jobs for 50 years – but more people than ever are working, says economist Mathijs Bouman. And the bottom line is, we are all getting richer because of it. Now, almost half a century later, in the year of De Wereld volgens Gijp and Marco Borsato and exactly zero men on the moon, industry has stopped generating jobs. The working population has grown to nine million of whom only 9% works in industry. In absolute terms this means that of the 1.3 million industrial jobs in 1969 only 800,000 are left. Meanwhile industrial production has doubled. Labour intensive factories became largely automated. But there is another reason why there are fewer factory workers compared to 1969: the relative importance of industry nose-dived. As industrial production doubled, GDP tripled. The Netherlands was de-industrialising because mass production was moving to low wage countries. To all who are worried about the present trends of globalisation, robotisation and what they mean for employment I say: your worst fears have been coming true for the last 50 years. Machines and foreigners have been stealing our jobs for years. Jobs not only evaporated in manufacturing. In construction the jobs total went down from over 550,000 in 1969 to 460,000 in 2017. Agriculture gave work to 275,000 people then and 195,000 now. Industry, construction and agriculture accounted for 40% of employment when Abbey Road hit the charts. In the Borsato era it’s 17%. And yet structural mass unemployment did not happen. On the contrary, more people than ever are working. So where did all these people go? They went to work for the government, in care, or opted for the business services industry. (Local) government jobs and the care sector accounted for 20% of the jobs total in 1969. That has been going up, slowly but surely, to 27%. In business services (comprising lawyers, architects, consultants, designers, researchers but also cleaners and security personnel) job growth was even more impressive. It went from 9% in 1969 to 21% in 2017. Automation and robotisation and cheaper foreign production mean jobs are lost. But it also means lower prices and more spending power. The new prosperity create a demand for new products and services and hence a higher demand for labour from companies that provide these products and services. In the end labour market equilibrium is restored. Yes, it’s textbook economics. But in times of robot fear and foreigner anxiety I’m happy to repeat it. 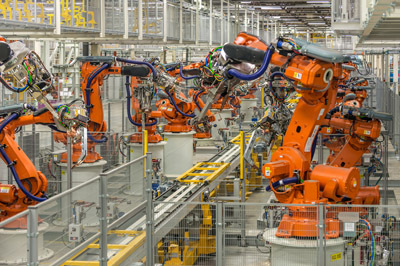 According to recent research by McKinsey, robotisation and automation will swallow up between 75 million and 375 million jobs worldwide between now and 2030. Or, in the kindly words of McKinsey, that is the number of people that will have consider a change of profession. Some 3% to 14% of all working people will be affected. China will have to absorb the biggest shock but in the West too the labour market will feel some hefty tremors. People will need help to face the transition. The need for re-training and additional training is evident but in some cases income support will be necessary, as McKinsey says. It will be a major transition, no doubt about it. But as the last 50 years show, coping with transition is something we are good at.